Writer/director J.C. Chandor has quickly become one of the most promising American filmmakers working today, maturing as both a director and storyteller with each new project – from Wall Street potboiler “Margin Call,” to man vs. nature survival tale “All Is Lost,” to his latest movie about an ambitious immigrant’s rise to power. All three films are markedly different stories, but they share a common thread in that they’re about characters that have been thrown into the fire and forced to react. “A Most Violent Year” might just be the strongest example of this yet, with Chandor content to sit back and allow the story to develop organically rather than force the point through manufactured conflict. It takes incredible discipline to build tension that way, and though he risks losing his audience with such a slow-burn approach, “A Most Violent Year” holds your attention thanks to some fine performances and a surprisingly engaging narrative. Set in New York City during 1981, statistically one of the most violent years in the city’s history (hence the title), Abel Morales (Oscar Isaac) finds his heating oil company embroiled in a turf war – with trucks hijacked and drivers beaten at an alarming rate – at the worst time possible. Abel has just gone into escrow on a waterfront fuel yard that could take his business to the next level, and he only has 30 days to close the deal with the bank or surrender the down payment. Meanwhile, a young district attorney (David Oyelowo) tasked with cleaning up the oil industry’s corruption launches an investigation into Abel’s company, despite the latter’s insistence that he runs a (mostly) clean and legal business. But when one of his drivers (Elyes Gabel) – having just returned to the job after being robbed at gunpoint weeks earlier – tries to protect himself from a pair of hijackers against Abel’s direct orders, everything that he’s worked so hard to create threatens to come tumbling down. 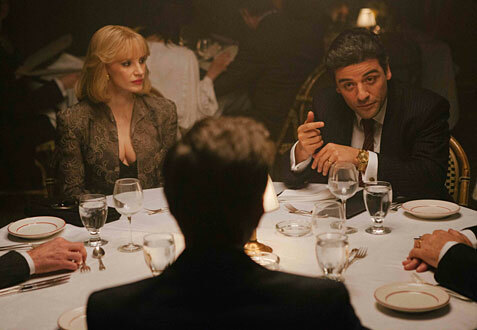 A smartly directed character study of a man fighting to uphold the antiquated ideals of the American Dream – one built on hard work and luck – in a world that now rewards those who lie, steal and cheat, “A Most Violent Year” is very clever in that it’s basically a gangster movie about a man who has no interest in becoming a gangster. Abel doesn’t condone violence (he can’t even bring himself to kill a deer after hitting one with his car) and refuses to do things the easy way, unlike his mobbed-up rivals and his wife, Anna (Jessica Chastain), the daughter of a famous Brooklyn gangster who might just be the toughest, most immoral one of them all. Abel is a lot like Michael Corleone in “The Godfather,” unwilling to compromise his beliefs simply because the business dictates that he does. But while Corleone eventually succumbed to his family’s criminal ways, there’s something to really admire about Abel’s stubborn determination, even if he seems foolish for creating so much trouble for himself, his family and his employees. Abel never reacts the way you think he will, and that’s exactly what makes his story so intriguing, because although we’ve been conditioned as moviegoers to expect these kinds of crime dramas to follow a similar formula (and Chandor’s film isn’t totally innocent of that), he constantly surprises with his refusal to bend. It’s one of Oscar Isaac’s best performances to date, commanding the screen with an ice-cold intensity that evokes Al Pacino in his prime. Were it not for some especially stiff competition this year, he would almost certainly be among the candidates for Best Actor, but as it stands, Isaac is a very unlikely dark horse. Jessica Chastain doesn’t get nearly as much screen time, but she creates a fierce counterpart to Abel – equal parts Elvira Hancock and Lady Macbeth – that suggests she’s not to be messed with, while Albert Brooks turns in a subtle but enjoyable performance as the company’s shrewd lawyer. Much like this year’s “The Drop,” Chandor’s character-driven drama owes a lot to the work of Sidney Lumet, although it’s an entirely different 1970s classic (“The French Connection”) that no doubt inspired the excellent chase sequence in the final act, which takes place just as the mounting tension comes to a boil, nearly ruining everything Abel stands for in the process. 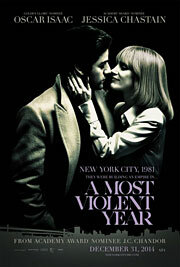 Though the story is almost too simplistic at times (it feels like there’s more material to be mined from the criminal component and Abel and Anna’s marriage), “A Most Violent Year” is a really well-made film that’s just on the edge of being truly great. That seems to be the story of J.C. Chandor’s career, but while his latest feature may not be the prototypical Oscar movie, it would be a shame if it went unnoticed in the midst of all the awards season hoopla.